The conflict between Joseph and his brothers, particularly that between Joseph and Judah, runs like a seam across the entire history of Israel. At times Joseph gains the upper hand, at times Judah prevails, but the schism always resurfaces. Our sages even speak of two messiahs, each with a role to play in the final fulfillment of Israel’s mission—a messiah descended from Joseph, and a messiah from the royal house of David, from the tribe of Judah. The conflict has its roots in Jacob’s marriages to Leah and Rachel. Jacob’s preference lay with Rachel—she was his first love and the one he regarded as his primary wife. But Leah was the first he married, the first to bear his children, and the one to emerge victorious in the sisters’ competition to provide Jacob with the most sons. All of Leah’s six sons were born before Rachel’s firstborn, Joseph; Rachel had a total of two children, as she died while giving birth to her second son, Benjamin. As Jacob’s firstborn, Leah’s son Reuben is initially slated for leadership in all areas of Jewish life. But Reuben sins, and his firstborn’s rights are transferred to three of his brothers: the priesthood goes to Leah’s third son, Levi; the kingship to Leah’s fourth, Judah; and the “birthright” (the right of the firstborn to a double portion in his father’s heritage) to Joseph. Thus Joseph’s descendants comprise two tribes, Manasseh and Ephraim, and receive two territories in the Holy Land. Jacob transfers his love of Rachel to her son Joseph, demonstrating his greater preference toward him over his brothers—as he had demonstrated his preference of Rachel over Leah. The brothers’ jealousy is augmented by Joseph’s dreams, which Joseph insists on repeatedly describing to them and to his father—dreams which foretell his mastery over them. This the sons of Leah are determined to prevent at any cost. Shimon and Levi plot to kill Joseph; Judah prevents this, but oversees his sale into slavery. But the brothers’ victory is short-lived. Soon they find themselves in Egypt, at the mercy of a harsh viceroy who, unbeknownst to them, is their banished brother. They prostrate themselves before him in fulfillment of his dreams. Judah confronts Joseph, but finds his considerable physical might and intellectual prowess bested by his younger brother. Then comes the moving scene in which Joseph reveals himself to them and is reconciled with them. Joseph is now the undisputed leader of the fledgling nation. He is their protector and their source of sustenance. Even Jacob bows to him. When the people of Israel emerge from the Egyptian exile, it is under the leadership of Moses and Aaron, both Levites. But it is Joshua, a descendant of Joseph, who leads them in their conquest of the Holy Land. Several generations later, another descendant of Joseph, Gideon, liberates them from foreign rule and governs them. For 369 years the Tabernacle, which as the forerunner of the Holy Temple serves as the spiritual epicenter of Jewish life, is situated at Shiloh, in the territory of Joseph. When the people of Israel ask for a king, a descendant of Rachel, the Benjaminite Saul, is endowed with the crown. Then, after centuries of Josephian ascendancy, the pendulum swings once more. David, the scion of Judah, is anointed as king; his struggles with King Saul are a replay of the age-old Leah/Rachel rivalry over the leadership of Israel. For seven years David reigns in the Judean city of Hebron, while a son of Saul is the recognized king in the north. But then the sovereignty of David is accepted by the entire people of Israel. David makes his capital in another Judean city, Jerusalem. His son Solomon builds the Holy Temple on a part of the city which straddles the boundary between Judah and Benjamin. The schism seems to be healed, the people united, with the leadership firmly in the hands of Judah. But once more the conflict resurfaces. Following Solomon’s death, Jeroboam, a descendant of Joseph, leads a revolt against the royal house of David. He even gets other tribes descended from Leah to join him in the renunciation of the Judean leadership. For the next 240 years, the Holy Land is split into two kingdoms: the northern kingdom of Israel, encompassing ten breakaway tribes under Josephian leadership, and the southern kingdom of Judah. (Interestingly, the tribe of Benjamin remains loyal to the Judean throne.) The sons of Joseph are simply not prepared to accept the sovereignty of Judah. The breach persists to this day. A century before the destruction of the first Temple, Shalmaneser, king of Assyria, overran the northern kingdom of Israel and exiled the ten tribes to an unknown place. They were never heard from again. The rest of Jewish history, as we know it, is the story of the surviving tribes of Judah and Benjamin, a significant part of Levi (whose priests and Levites lived in cities throughout the Holy Land), and a small number of Jews from the other tribes who lived in the kingdom of Judah. Chassidic teaching explains the Joseph/Judah conflict as a dichotomy that extends to every area of life: the conflict between growth and self-fulfillment on the one hand, and subservience and commitment on the other. For ourselves (to enjoy life, realize our potential, achieve transcendence, etc.). In service of something greater than ourselves (society, history, G‑d). Indeed, we sense both “a” and “b” to be ever-present forces in our lives. On the one hand, we are strongly driven to better ourselves, to “get the most” out of every experience and opportunity. We also sense that this is not a shallow selfishness, but something very deep and true in our souls—something implanted in us by our Creator as intrinsic to our identity and purpose. On the other hand, we are equally aware that we are part of something greater than ourselves—that if our existence has meaning, it is only because it serves a reality beyond its own finite and subjective self. We find both sensibilities expressed by the Torah and in the words of our sages. On the one hand, the Torah (Deuteronomy 11, Leviticus 26, et al) repeatedly stresses that G‑d’s program for life is for the good of man, both materially and spiritually. “The mitzvot were given only to refine humanity,” says the Midrash. The Talmud even goes so far as to state: “Every man is obligated to say: ‘The world was created for my sake.’” Chassidic teaching describes the saga of the soul as a “descent for the purpose of ascent”—the soul’s entry into the physical state entails a diminution of its spiritual faculties and sensitivities, but the purpose of it all is that it be elevated by the challenges and achievements of earthly life. On the other hand, the highest praise that the Torah has for Moses, whom Maimonides calls “the most perfect human being,” is that he was a “servant of G‑d” (Deuteronomy 34:5). Our sages repeatedly exhort us to strive for altruism in our lives, so that everything we do is permeated with the recognition that “I was created only to serve my Creator” (Talmud, Kiddushin 82b). This duality is also discussed by our sages in terms of “learning” and “deed” (or “Torah” and “mitzvot”). Thus the sages of the Talmud debate: Which is greater, learning or deed? Learning involves the development and perfection of self, while doing entails the servitude of self to the task at hand. Why was man placed on earth—to better, refine and perfect the self, or to achieve the abnegation of self in service of the Creator? Rachel, “of beautiful form and of beautiful appearance,” embodies the drive for self-fulfillment and self-realization, while the humble, submissive Leah represents our capacity for servitude and self-effacement. Rachel’s qualities were strongly emphasized in the handsome, charismatic, enterprising Joseph, who unabashedly relates his dreams of greatness, and proceeds to turn his every circumstance into a personal success. Sold as a slave, he soon becomes overseer of all his master’s possessions. Thrown into jail, he rises to a high position in the prison administration, and from there to viceroy of the most powerful nation on earth. His external beauty and successes mirror an inner spiritual perfection, as he perseveres in the face of moral tests and retains his righteousness in the most corrupting of environments. Judah, in contradistinction, displays the humility and commitment of one to whom life is a duty rather than an achievement. He steps in to prevent the murder of Joseph. He readily owns up to his responsibility for the sale of Joseph, and to his culpability in the incident with Tamar. He pledges to be accountable for Benjamin’s safety, and when the latter is retained by the Egyptian viceroy, offers himself as a slave in his place. He is the acknowledged leader of his brethren, but his is a leadership burdened by responsibility and sustained by commitment, rather than one that is buoyed by self-confidence and driven by ambition. So Joseph, whose name means “to add,” represents growth and achievement, while Judah, whose name means “to acknowledge” and “to submit,” is the paradigm of commitment and self-abnegation. These two forces vie for ascendancy in our every thought and feeling, in every choice we make and every action we take in the course of our lives. At times the one gains the upper hand; at times the other rules our lives. On the macro-historical level, these are the two contrasting forces at play in the history of our people, as Judah and Joseph vie for the leadership of Israel. There is, however, a point at which these two forces converge and unite. This is the point at which it is recognized that the refinement and perfection of the self can itself be an altruistic enterprise—when it is undertaken solely because this is what the Creator desires from us. When it is appreciated that (as the Talmud resolves its above-cited debate), “Learning is greater because it brings to deed.” A better self—a more knowing, sensitive, accomplished self—is a self better equipped to fulfill its purpose in creation. Indeed, the making of this better self is the fulfillment of its purpose in creation. Ultimately, improving the self is the ultimate service of G‑d. Rabbi Zusha’s life was driven by the burning ambition to become an Abraham—but only in order that G‑d should have another Abraham. If the end result is that there’s only one Abraham for G‑d, what’s the point? When a person attains this acme of love for G‑d, the Judah and Joseph in him are in full harmony with each other. His Judah reigns sovereign—the ultimate criterion is service of G‑d. But the Joseph in him is not silenced or suppressed. On the contrary: its passions are cultivated, its ambitions are encouraged, its selfhood is fully integrated in the selflessness of the Judaic self. 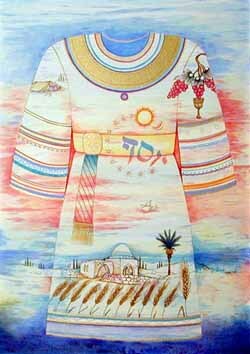 Illustration by Chassidic artist Michoel Muchnik; click here to view or purchase Mr. Muchnik's art. Actually, they are two distinct individuals - one Messiah descended from Judah and a different Messiah descended from Joseph. You can see this in the article above as well as at the link in my previous comment. Subtle and powerful Thank You for the clarity your essay brings to our most bitter inner conflicts. As an Observant Jew, like me constantly in conflict between Yoseph's force of desire for self realization and Yehuda's force for the sense of duty, responsibility love and commitment to HaShem's commanded Torah. Lost 10 tribes You write that "a century before the destruction of the first Temple, Shalmaneser, king of Assyria, overran the northern kingdom of Israel and exiled the ten tribes to an unknown place. They were never heard from again." To hmmm... Let's not compare... Right? Amazing and very insightful article! More Power to Yanki Tauber! Yanki you hit a home run with this one--definitely Divinely inspired. There is so much "meat" here, it is a full, multi-course meal!